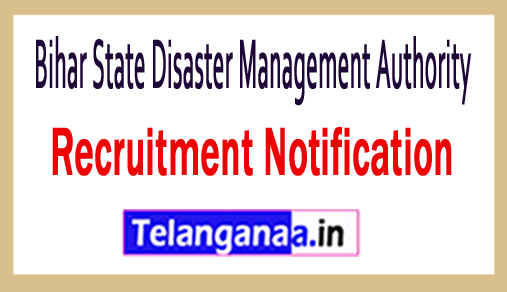 Bihar State Disaster Management Authority is looking for those who are interested in filling 01 posts of Project Officer and looking for excellent job seekers. Recently, Bihar State Disaster Management Authority has broadcasted an employment advertisement in the form of BSDMA recruitment. Candidates wishing to complete this recruitment process, who are willing to apply for the post, can participate in the Walkin interview at the place given on September 13, 2018. Essential qualification: Those job hunters have done master's degree (Engineering / Earth Science / Agriculture / Natural Science / SOSC / Disaster Management) from a recognized University or Institute. Candidates who are willing to apply for a job, their upper age limit is 62 years. Participation of candidates will be based on their performance in the interview which will be conducted by the recruitment committee of the Bihar State Disaster Management Authority. Job seekers are interested in applying for the above mentioned positions. First of all, they need to go through the official website http://www.bsdma.org. A list of this latest opening link will open and the candidates will have to select the most appropriate link which will give more information about full advertisements BSDMA vacancies. After reading the full instructions, the claimants need to participate in the interview interview with the application at the address given below. Walking in organized interview: 13-09-2018. Click BSDMA recruitment notification here.